​Winter has arrived with the usual cold temperatures and frozen precipitation that plays havoc with our plans and bodies. We take special care to stay warm and healthy during the frigid months and should do the same to help our Havanese friends enjoy the winter months. Although Havanese were developed in Cuba with its tropical environment, the breed tolerates cold weather very well. Many individual dogs seem to enjoy colder weather and will happily play in the snow like little kids without the need for outerwear. The double-coat which traps cool air during the summer also traps heat in the winter to help insulate the dog. Havanese are not like breeds dedicated to cold weather like Huskies and Malamutes, therefore moderation and common sense of how long a Havanese can stay outdoors and play should be taken into consideration. Havanese with long show coats will have thicker layers to help keep warm. For older and younger Havanese with difficulty regulating body temperatures and individuals with clipped coats, outwear may be necessary. A wide range of fashions and styles are available commercially. In fact, you might be able to get a different outfit for each day of the week. However, not all individuals will tolerate clothing. Some positive training and adjustment would be necessary before your Havanese willingly gets dressed to go outdoors. Coats, sweaters and cloaks could make wonderful accessories for your dog in the cold. For wet winter weather, a waterproof outer shell with an inner lining for warmth would be ideal. Also, look for coats that have a "plastron", a section that will cover the chest and belly of your Havanese. This helps keep the undersides warm and clean from the wintry mix of slush and dirt. In addition, if your Havanese is willing to tolerate booties, footwear is extremely useful in stopping the build up of ice and dirt in their paws. It is important to remember that outerwear will continually rub against a dog's coat. This constant friction will produce static and on longer coated breeds like the Havanese, will also lead to mats and tangles. Constant wearing of outerwear also leads to doggy odor and dry skin. Therefore, grooming with regular brushing is just as important during the winter months. Be sure to use a moisturizing shampoo or a conditioner in addition to your dog's regular shampoo to help relieve dry skin on your canine companion. The dry air from furnaces creates an environment ripe for itchy and chapped skin especially since dogs do not secrete skin oils in the manner of humans. Since we almost never "dry brush", mix conditioner with water to spray on your dog when grooming. This will help cut down on static as well as condition the coat and skin. By keeping the skin moisturized, your Havanese will feel much more comfortable during the winter months. ​If your Havanese prefers to go walking around in its birthday suit, special care must be taken to keep your dog safe and healthy. Havanese being the short dogs that they are, can easily absorb dirt like a mop with a build up of snow and ice. Brushing out the ice and dirt from the chest and belly hairs and drying off the coat will help to keep your Havanese warm. In addition, check the paws for ice, salt and other particles that litter the winter streets. Salt, sand and other de-icing agents can irritate the paws and can often be poisonous. If left untreated, health issues can arise. Therefore, rinsing and thoroughly drying the paws will help to prevent injuries and illness. ​Use common sense when going on outings with your Havanese. Heavy and wet sleet like precipitation will cling to your dog's coat and will easily penetrate the coat to the skin. Meanwhile, fluffy "drier" snow will be easily brushed off and be less dangerous. If the weather is too cold for you, then its probably too cold for your dog as well. Therefore, take notice of the weather and adjust accordingly to have your Havanese stay healthy and happy. 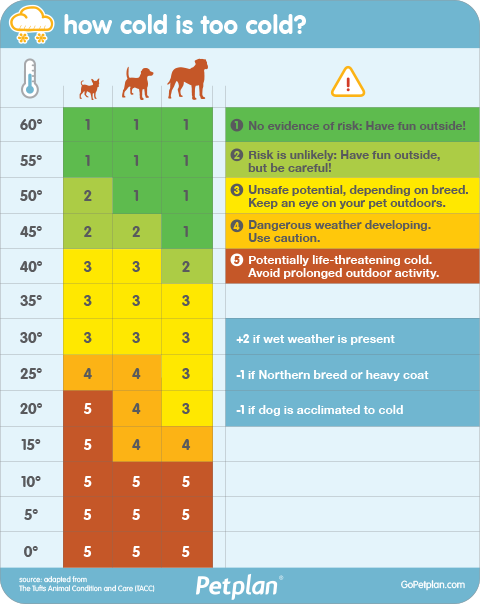 ​Also, feel free to use the handy chart below as a guideline to help make a choice about how to keep your Havanese safe and warm!